This must-have highlighting trio brings 24K magic to your skin in three show-stopping shades of gold. Born from Charlotte Tilbury’s sellout Bar of Gold highlighter, the Bar of Gold Highlighter Palette is enriched with gilded pearls for a sculpted, lit-from-within glow. Adorn yourself in three shades of gold for gilded radiance all season long—if you can get one before it’s gone! Original Gold: Bright gold with a shimmer finish. Rose Gold: Soft blush with a shimmer finish. Gold Bullion: Golden bronze with a shimmer finish. 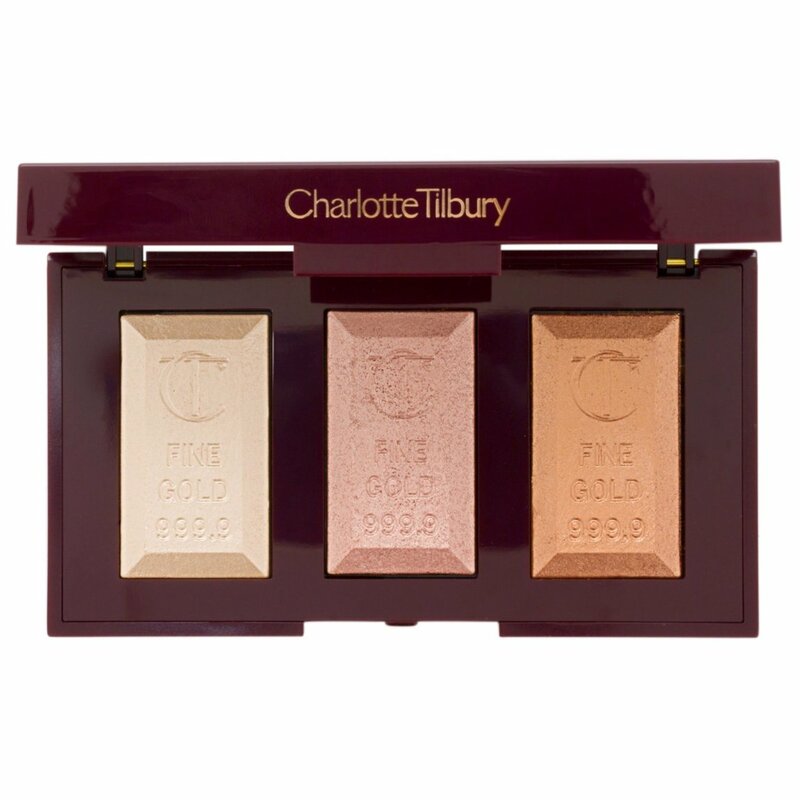 Palette includes Charlotte Tilbury’s best-selling original Bar of Gold shade, rose gold for a soft wash of blush, and gold bullion for a seductive, sunkissed bronze look. Luxurious pure gold pearls illuminate the skin for a celestial, lit-from-within glow. Light-reflecting, high-tech “wet” powder defines and sculpts the appearance of the cheeks without a powdery finish. Swipe shades along cheekbones, temples, cupid’s bow, décolletage, and the bridge of your nose for glowing definition. Give eyes and lips an added pop of radiance by applying shades as eyeshadow or pressing the shimmering powder on top of your lipstick. The colors are gorgeous but I feel like to get any kind of payout you have to dig your brush into the pans to pick up any product. It's a very dry formula and hard pressed so it takes some work to really pick up any pigment. Once you have the product on your face though, it's stunning and doesn't emphasize any texture.